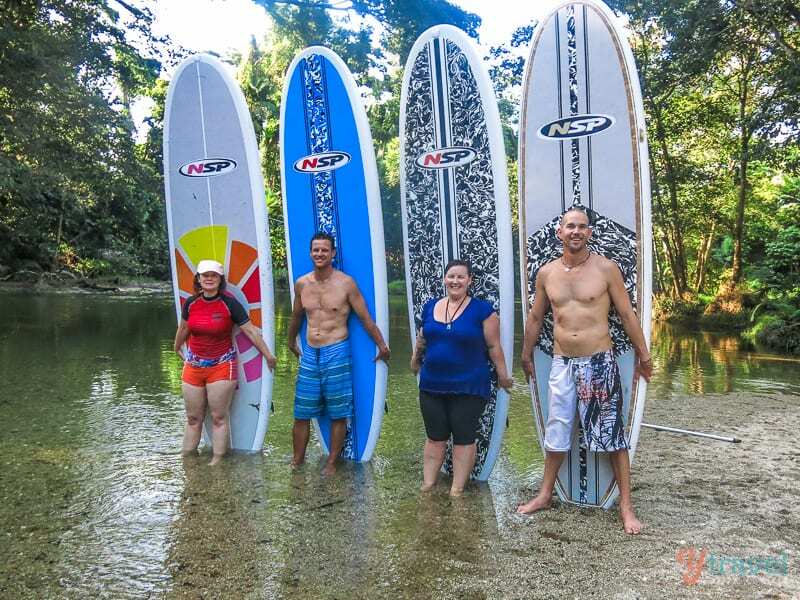 This is a guest post from our friends Cam and Nicole at Traveling Canucks. Read more about them below..
Have you ever witnessed the raw beauty of a desert oasis? We hadn’t. We figured the only way to experience such a unique eco-system would be to travel to Northern Africa or the Middle East. 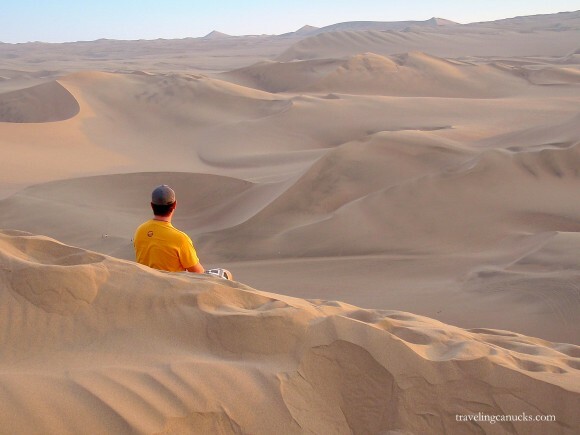 You can imagine our surprise when a fellow traveller recommended we visit the giant sand dunes of Huacachina, located south of Lima on the Pacific coast of Peru. “Sand dunes? In Peru?” we replied. What was this guy talking about? When we thought of Peru, images of Machu Picchu and the Amazon Rainforest came to mind. Not sand dunes and dry barren desert. Our new friend reached into his pocket and pulled out his digital camera. The photos didn’t lie. There he was, standing in front of a placid desert lake with enormous sand dunes towering in the backdrop. It didn’t take much further convincing. 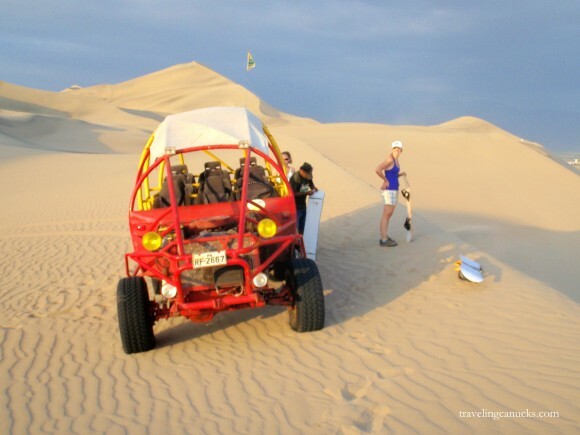 Sand boarding, dune buggy rides and poolside lounging was right up our alley. We departed from Arequipa, opting for first class seating with Oltursa (tourist class bus company). The overnight bus arrived at the larger city of Ica (the hub for Huacachina) about 10 hours later. It only takes about 4.5 hours to reach Ica from Lima, Peru’s capital. 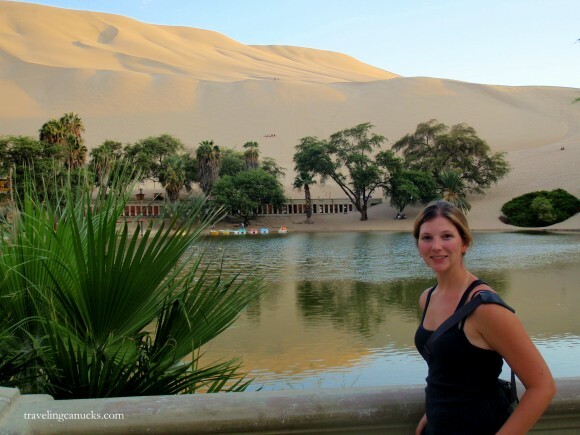 The village of Huacachina is built around a small natural lake in the Peruvian desert. 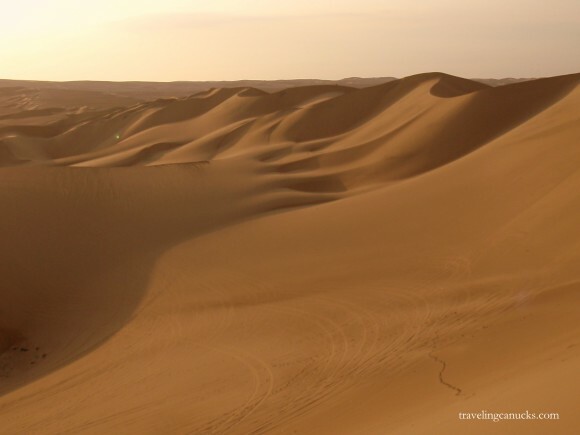 It’s become an increasingly popular tourist attraction for adventurers drawn to sand boarding and high speed dune buggy rides. Though we thoroughly enjoy lazy afternoons by the pool, our objective for Huacachina was to play in the sand. There are several tour operators located right in the village, offering morning and evening trips into the dunes when the sand is cooler. The thrill of the dune buggy is a rush like no other. Our driver loved his job. His evil yet gentile grin was unmistakable. He thoroughly enjoyed scary the crap out of his guests! Have you ever been in a vehicle that speeds up as it approaches a cliff drop? We hadn’t. The feeling is similar to the feeling you get when on a roller coaster that is slowly climbing up its first peak, just before you’re about to descend. Only in the desert, it’s the real deal. Our lives were placed in the hands of our driver. Though skilled at his craft, the element of danger is undoubtedly present, adding to the thrill. We explored the sand dunes at high speeds, stopping periodically to test out the sand boards. If you’re like us and enjoy big mountain snowboarding, ease your expectations when sand boarding. Though some of the dunes were quite steep, it’s still quite difficult to get the kind of speed that a skier or snowboarder is accustomed to. Nevertheless, it’s a great way to spend an evening! That is, until you bail and tumble down the sand dune, covering your sweaty body with sand from head to toe. Sand Boarding Tip: Use an old snowboard with proper bindings and boots if available. Otherwise you’re likely to be strapped to a heavy wooden plank with poor control. Our lesson learned, there’s a lot more to Peru than the Incan Lost City of Machu Picchu! The Traveling Canucks are Nicole and Cameron Wears, a newlywed couple that currently reside in beautiful Vancouver, British Columbia on the west coast of Canada. A passion for travel and adventure sparked a 2009 round the world journey that changed their lives forever. Join them at Traveling Canucks where they share travel stories from around the globe, or follow them on twitter. Who knew there were sand dunes in Peru?! That last photo is amazing! Ha! I had that same reaction when I found out Peru has an oasis. There is such a laid back atmosphere there that feels so relaxing – even when rolling down the dunes all high on adrenaline. I had an amazing time sandboarding and dune buggying in Huacachina. After that, I spent a couple days getting all the sand off me and my stuff. It gets EVERYWHERE!! And it’s true, Peru has so much more than Machu Picchu. Nice guest posts! Love your pics. These pics are unreal! I’m so sad I missed this place when I was in Peru. It’s definitely on my list of places to visit. Looks like soooo much fun. 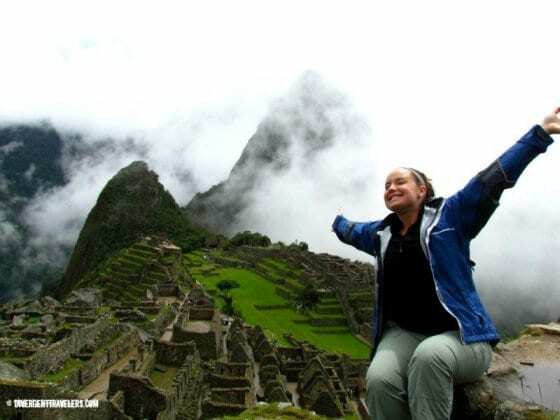 This looks so fun, I’m heading to Peru in a few weeks and this is at the top of my list! 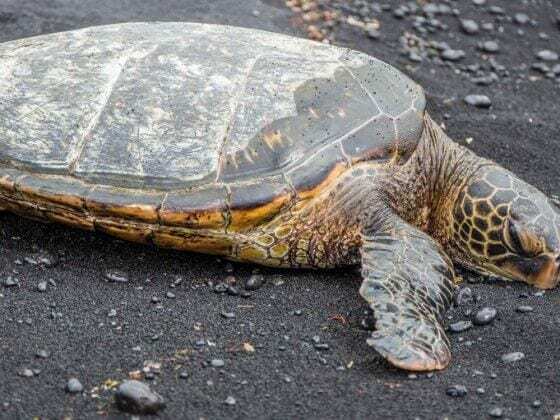 Hi Ayngelina, I am heading to Mancora tomorrow and will slowly work my way down to Huacachina and other parts so maybe our paths will cross. I did that as well when I was in Peru. It was a blast! I had a tough time finding internet there though. looks awesome! we did it in san pedro de atacama in chile. was super fun as well, but going by your photos i think its probably better where you did it. Ya, it’s not fun falling is it?! I’ve always been ain awe of deserts and sand dunes — anywhere! But I’ve never seen anything quite like this and certainly wouldn’t have expected it to be in Peru. Beautiful photos! I am going to be in Peru in two weeks time. I had no idea there were sand dunes. I thought I was going to lush green mountains. Shows how much I know about my holiday destination. But then again that is why I go on holiday to learn, discover and take part in new cultures. Thanks for the article. Don’t worry, you’re not alone! That’s exactly what we thought when we pictured Peru. Its arguably the world’s most diverse country when you factor in its small size. You’re going to have a great time! Awesome post! Great pics on sand boarding. Looks like a lot of fun! We’ll be in Peru next month and will definitely head there. Sounds fun! Awesome experience you faced during travel to Peru Hope you enjoyed so much at Peru.thanks for sharing experience.The pictures are fabulous. Awesome information! I can’t wait to check these dunes out for myself! 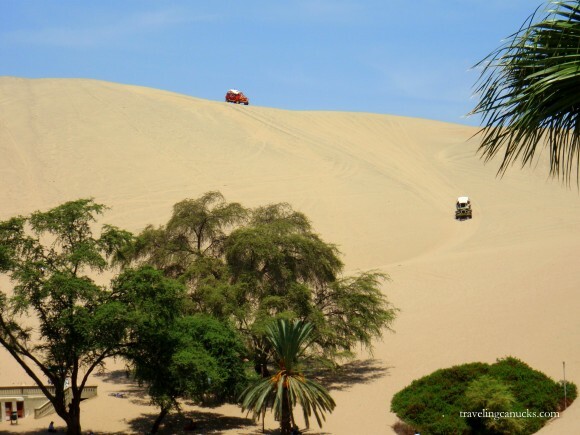 Sandboarding in Peru….Who knew! Great post…brought back fab memories of a time when lubing up the underside of a roughly hewn sandboard, and slipping feet under straps made of old seatbelts seemed like a perfectly natural thing to do…why not? Pointing straight towards the bottom and literally letting gravity do its thing, and hoping for the best…coming “to” with a mouthful of sand. 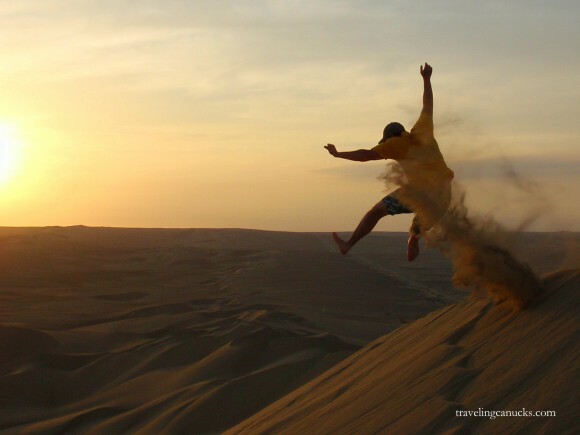 This article has brought me many memories of my childhood because I am Peruvian and used to go to Ica and the Huacachina during the summer holidays, sandboarding is definitely a fun activity to do with kids.